Another lesson in how not to deal with an employee’s misconduct. You may remember the story. . . the owner of a small business caught one of his employees stealing from his company. 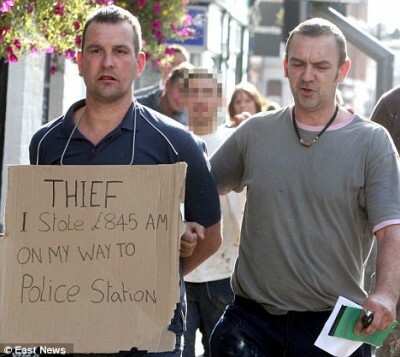 He hung a sign saying ‘thief’ around the man’s neck and frogmarched him to a police station. But while the employee was let off with a police caution, the business owner spent three months facing a charge of false imprisonment until the case was dropped. And as if that wasn’t enough, the businessman then had to pay his former employee £5,000 compensation and £6,000 legal fees in an out-of-court settlement to avoid a civil case for the ‘humiliation’ he suffered. Even if an employee is guilty of gross misconduct, you still must follow the correct procedure. Otherwise, the employee could claim unfair dismissal. The procedure is set out in the ACAS Code of Conduct. Taking matters into your own hands could lead to an Employment Tribunal claim against you. If you suspect that one of your employees has committed an act of gross misconduct, you should take legal advice to ensure you follow the right procedure. The costs of getting it wrong and ending up in a Tribunal will far outweigh the costs of getting legal advice to ensure you get it right first time. Call Andrew Crisp on 01604 601 575 for a free consultation. Previous Entry: Can employees take time off work to look after their family?